I received this e-Arc from NetGalley and Mira in exchange for an honest review. Synopsis: On a quiet night in their tranquil suburban home, the Fulton family awakens to a nightmare. Four armed men force bank manager Dan Fulton to steal a quarter million dollars from his branch–strapping remote-detonation bombs on him, his wife Lori, and their young son. The FBI moves swiftly with a major investigation while Kate Page, a reporter with a newswire service, digs deep into the story. In the wake of the Fulton family’s abduction, questions emerge, including one of the most troubling: Is the case linked to Lori Fulton’s tragic past? Working as fast as they can, Kate and the investigators inch closer to the devastating truth–it’s not only the Fulton’s lives at stake, but thousands of others…and every second counts in the race to save them. While this is the third book in the Kate Page series, there’s no need to have read the previous two books, although I guarantee, once you read this you’ll want to. Sadly, this story really could have been ripped from the headlines. We’ve all read similar stories where a family member is forced to do something against their will in order to save their loved ones. 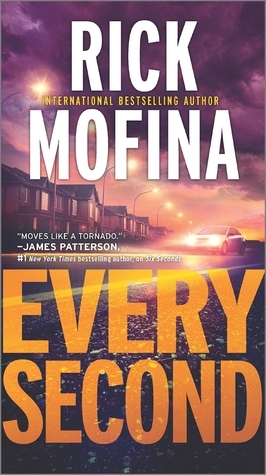 Rick Mofina is the master of taking a premise like this, and then adding intriguing and complex layers and characters which further grip the reader. The action begins on the very first page when Lori Fulton awakens to find masked gunmen in her bedroom. While it originally seems as though they’re just after the money, it’s soon obvious that that this is just the introduction to their ultimate endgame, and that it’s somehow tied to a tragedy in Lori’s past. As events unfold, we see things from the perspective of Lori, Dan, and Kate. In the hands of a lesser skilled author this could have been confusing, but one of Mofina’s many talents is creating characters that his readers can relate to, so I actually wound up being even more invested in what was happening with each person. While this is the first Kate Page book I’ve read, there’s enough teasing hints of her backstory that make me want to go back and read the first two. She’s a reporter with ethics who battles with her editor over writing a sensational story vs. a factual one. She also truly feels badly over what has happened to the Fulton family and is determined to do her best to discover the truth behind this appalling crime. There’s a couple of instances where her being in the right place at the right time were a little too incredulous, but they weren’t enough to interrupt the flow of the story. As I said previously, one of the things I love about Rick Mofina’s writing is the complexity of his characters and this is especially true of the villains in this story. While their actions are despicable and you can’t wait for each of them to get their comeuppance, they all have tragedies in their pasts which have set them on their present course. This serves to make them and their crimes more believable. From the first page the action never lets up, which made me read this in one sitting, despite it being over 400 pages. I kept telling myself “one more chapter”, but Every Second had me so mesmerized I just couldn’t put it down. Like his other books, Every Second has a little something for everyone: current events, suspense, mystery, thrills, and characters you’ll find difficult to let go of. If you haven’t read Rick Mofina before, this is a great book to start with. Sounds like a really good thriller. I know I can trust your recommendations.